The search for the perfect saddle is like a Holy Grail quest. Some folks are lucky and find the right saddle almost immediately, while others continue searching for "the one" and may take awhile. In this post, I will share my thoughts and experiences on the the Independence leather saddle from Rivet Cycle Works, which could very well be “the one” for me! The first leather saddle that I had was the Brooks B17 and it was great for about a year. As the leather softened and moulded itself to my sit bones, I could no longer ride it for more than an hour as the middle part was starting to push upwards into my nether regions. That was when I discovered that I needed a saddle with a cutout. This lead me to the Brooks Cambium C15 Carved which you can read all about here. I also tried the Brooks Cambium C13 Carved which is the lighter carbon version, and you can read my review of it here. It has been awhile since I have ridden a leather saddle, and I almost forgot what it felt like until I sat on one again and realized that nothing beats the comfort of a nicely broken in leather saddle! Even though I loved riding with the C15 and C13 with the weatherproof vulcanized rubber hammock, the feel of a leather saddle is still unbeatable when it comes to all-day comfort. I really wanted to give leather saddles another chance, and had a few things to think about. Leather does eventually sag, which unfortunately made my former B17 unrideable. But if I can prevent that from happening, or find a saddle where that problem is carefully managed in its design, then there's hope! When I first started cycling again a few years ago, it was at a very leisurely pace with a posture that was very upright. In the beginning, the Brooks B17 worked extremely well for that sort of riding. After discovering that I preferred a more forward leaning position on drop bars, the B17 no longer worked for me and I had to look at different options. I have narrow sit bones, measuring 105mm, and my height is 172cm. This gives me a wide range of options as I can choose small to medium width saddles with no issues. I prefer a setup where the bars are lower than the saddle. This is because I have longer than average arms for my height, and a saddle to bar drop of 50mm is still quite comfortable for me. This was confirmed with a proper bike fit measurement. When I travel with my bike and go touring, I do daily distances of around 50-80km on average and I usually travel for 1-2 weeks per trip. When I'm not traveling and just enjoying rides from home, I average between 80-100km a week. I also like hills! One of my favorite routes through Kuala Lumpur averages 800-1000m of climbing within 40km. I spend anywhere between 4 to 8 hours on the saddle for a ride. How do I decide on which leather saddle? With the above information on hand, it indicates that I have a preference for endurance or all-day riding, which translates well for travel and touring. I already know that I need a saddle with a cutout or a slotted design, with a shape that lends itself well for drop bar bikes where the bars are either level with or below the saddle height. As a base for comparison, the Brooks B17 weighs 520g. There are a number of leather saddles that are lighter, and I've named a few below. The Rivet Independence is the lightest of the bunch here. What makes the Rivet Independence unique is that its frame is made of a composite resin, and it also incorporates a tension plate that keeps the leather hammock from splaying and sagging. The Gilles Berthoud Aravis saddle also has a composite resin frame, but it does not have the tension plate. The Brooks Swallow incorporates the tension plate, but it does not have a cutout. Of the saddles listed above, the ones with a cutout are the Gilles Berthoud, the Rivet Independence and the Selle Anatonimca. Empirically speaking, the Rivet Independence ticks all the boxes for all the things I was looking for. Not only is it the lightest of the saddles in the list, but it also has a cutout and a tension plate. Basically, Rivet Cycles took all of the design elements that I was looking for and combined it all together into a single saddle! The biggest factor that affects the longevity of a leather saddle is weather, especially rain. I live in Malaysia where the tropical rainstorms can be extremely heavy and very sudden. On very heavy days of rain, you could leave a 2L bucket outside for less than an hour and it'll fill up. Obviously I won't be riding when it gets that heavy, but sometimes when you are caught between a storm, you really don't have a choice but to keep going until you find shelter. Some manufacturers utilize really thick leather to resist the weather, which can take a longer time to break in. Other manufacturers take a creative approach with laminated leather layers that are designed to resist the weather and prevent sagging. Either way, it's always good to have some sort of cover for the saddle when it's really wet outside, but often times the weather will surprise you. In the case of the Rivet Independence saddle, it is designed with a thick piece of leather, and it is also reinforced with a laminated fabric layer underneath to resist the water spray that you'll get from riding on wet roads. The saddle is also available in colors that have a waterproofing treatment right from the tannery. In practice, this makes it a very firm saddle to start with, but in terms of longevity, you won't be seeing any sag in the hammock for a long time. In addition to the leather construction itself, the tension plate keeps it all together and prevents the sides of the saddle from splaying out over time when you are perched on it. My old B17 does not have this, so when pressure is applied on the top of the saddle, the sides splay out and it completely loses its shape. To date, I've ridden almost 1,500kms on the Rivet Independence over the last few months. It's not a really big amount of mileage by any means when compared to some of our ultra touring friends, but it's good enough for average folks and it's enough distance for me to talk about how it feels. The top of the Rivet Independence saddle is relatively flat when compared to the more rounded profile of the Cambium saddles. With the Rivet, I find that there's a bit more room for me to find the perfect spot to perch my sit bones. I made the choice to go with the vegetable tanned chestnut color which isn't the waterproof variety (but it's so pretty! ), so I periodically dab it with Brooks Proofide that I've had lying around. I dressed the leather with a healthy amount of Proofide when it first arrived in the mail, and since then it has gotten a bit darker with age. The only additional dressing of Proofide I applied was when the leather got scratched up a bit in the traveling that I've been doing. Otherwise, it has held up quite well and has weathered very nicely – scrapes, tiny dents, scratches and all. And it has formed a pleasing dark patina. The saddle felt quite firm during the first 500kms of riding, but it was still comfortable. In fact, it actually felt a lot like my Brooks Cambium C15. As I approached the 500km mark, the leather slowly started to shape itself to my sit bones and the ride became more comfortable. The beauty of a leather saddle is that it will grow in comfort the longer you use it. In the amount of time that I've enjoyed the saddle, I've only had to tune the tension just once at the 1,000km mark to tighten it up a bit. The Rivet Independence saddle sits on my Change Bike and it has gone touring with me to a few places. I've put it through quite a wide range of weather conditions and have done rides in all sorts of terrain and I can confidently say that it is by far my favorite saddle! Regardless of the terrain or riding style, I have not had a problem dialing in a position on this saddle, and find it to be quite adaptable – I've used it with both flat bars and drop bars. Travel in Spain. I have toured with the saddle on a 2-week trip to Spain in November 2017, and you can read about part of the journey in Andalucía starting with Cycling Andalucía, Spain - Part 1. The landscape of Andalucía is predominantly mountainous terrain, so there were plenty of long climbs through hills and mountains. There was one day in particular where I spent a good 8 hours on the saddle with a climb to El Torcal and the saddle provided much needed comfort all the way through. Longer local rides. Back in Malaysia, I've cycled up into Cameron Highlands from Ipoh, which is a slow and steady climb all the way up to an elevation of around 1,500m within 60km. We went through both rain and fog as we approached higher elevation and the saddle performed well in those weather conditions. At the same time, I've also done some coastal rides on very flat roads under extremely hot weather over distances of 80km and the saddle remains comfortable even with all the sweat pouring out of me. Travel in Bali – and a race too! More recently, I was on a trip to Bali and took part in GFNY Bali 2018 which just happened to be my first race, ever. Although I only took part in the medium distance 89km event, I'm happy to say that I finished it within the qualifying time. Even when riding fast, I did not experience any thigh rub or any discomfort at all, and I loved how easy it was to shift back and forth on the saddle to dial in pedaling power when going between steep hills and flats. 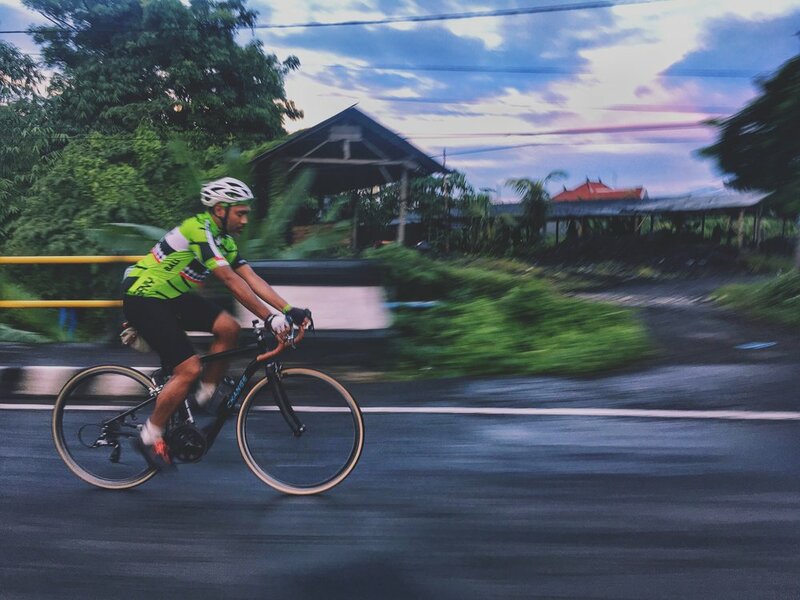 And two days before the race, I also joined an 80km ride from Denpasar to Ubud and back, and was still in relative comfort leading to race day. If inanimate objects could have personality and character, the Rivet Independence saddle certainly has one that has grown with me. Somehow, the small scratches and marks that the saddle has picked up over time has added to its appeal. Just by looking at it, you know that it is a well traveled saddle that's had plenty of love. And love it, I certainly do! It really is quite light. There are obviously lighter saddles, especially the ones that are made entirely of carbon. But good luck trying to stay perched on that for more than a day. When it comes to leather, it's all about comfort, and getting something that is lightweight is a bonus. At 360g, the Rivet Independence is the lightest leather saddle I've seen so far, and the combination of the leather upper with the cutout and the titanium rails provides unparalleled comfort, at least for me. Beautiful construction. The Rivet Independence gets all the little details right. From the sculpted rivets binding the leather to the frame, the cutout pattern, the beautiful titanium rails and engraved tension plate, you know from the beginning that this is a premium product with an extremely high level of quality. It's simply a well made saddle. Decent weather resistance. I can only comment on the vegetable tanned chestnut leather, but with a bit of Proofide applied to the leather, it has withstood torrential downpours without any damage or extensive sagging. The laminated fabric layer underneath also contributes to its overall weatherproofing and helps the leather to stay taut longer. I'm quite sure that the waterproofed variety would be even more carefree in its maintenance. This saddle gets 5 stars – hands down. It is absolutely the most comfortable saddle I have ever ridden with, and can be enjoyed for both slow exploratory rides and fast paced rides. Now, go ahead and take a look at Rivet Cycle Works and check out their size guide as well!